Michael Schlow is a savvy chef/restaurateur with a growing empire. He now has six restaurants in the DC area (Tico, The Riggsby, Conosci, Casolare, and Alta Strada), as well as five restaurants in New England, and one in Los Angeles. 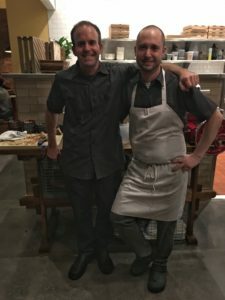 Schlow has me jumping for joy when I learn that he has reunited two top talents who previously worked together at Osteria Morini. Executive Chef Matt Adler and Executive Pastry Chef Alex Levin recently joined Schlow and his SRG team. Levin is leading the pastry programs at all SRG restaurants around the country. Adler has oversight for culinary development of Italian concepts in the group. In their new roles it won’t be easy to find Adler and Levin in the same place at the same time. Fortunately, the opening of Alta Strada Mosaic has them combining forces to get the restaurant up and running. I seize an opportunity to experience the duo in action once again. Alta Strada specializes in rustic Italian fare. The menu features a selection of pastas, pizzas, and Italian-accented entrees such as branzino with eggplant caponata, red wine braised short ribs with polenta, and lemon chicken with cherry tomatoes and prosciutto. The menu, developed by Adler and Head Chef Nicole Belverd, is an adaptation of the Alta Strada in the Mt. Vernon neighborhood of DC. The long drive from Maryland to Northern Virginia (actually it’s only 30 minutes door to door) warrants a cocktail. Cranberry’s Bitter Half is a blend of gin, aperol, tuaca, and house-made cranberry soda. The drink pairs well with a soft, creamy orb of stracciatella, which gets a boost from tangy green apples and spicy honey. 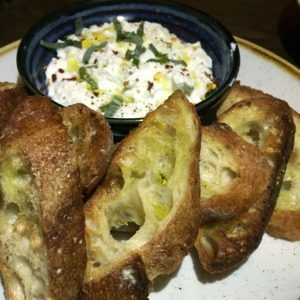 The Crostini of the Day is housemade ricotta coupled with sage, accompanied by a plate of toasty “Nate’s Delicious Bread.” I have no idea who Nate is, but I do like his bread. The sleeper hit among apps and salads is a plate of fresh greens with grated pecorino and truffle vinaigrette. As complex dishes take center stage, it’s a nice reminder that a simple dish with quality ingredients can be super satisfying. Pizza at Alta Strada is a main attraction, but we decide to skip it and head right to pasta. I’ve seen Instagram photos of the pizza post-visit, and they have me yearning for a return. But Matt Adler’s pasta game is so strong that we focus our meal on the housemade pasta section of the menu. Fedellini pasta captures my attention, and it’s a good call. 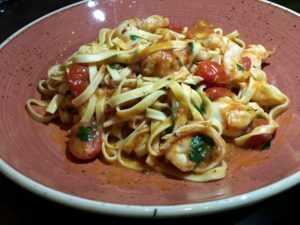 The al dente pasta is complimented by a toss of shrimp and crushed cherry tomatoes, and a dash of hot chilies. The intense umami flavor of Mafalde pasta with mushroom, truffle, and Parmigiano is particularly swoon-worthy. Charred broccoli rabe with lemon and olive oil is the perfect intermezzo to a carb-heavy meal. At Osteria Morini, Alex Levin’s deconstructed desserts won acclaim. He was named best Pastry Chef by the Restaurant Association Metropolitan Washington in 2016. 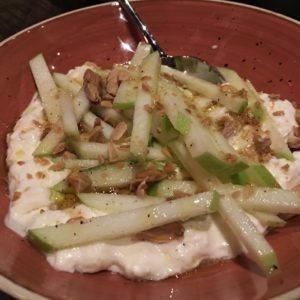 Desserts at Alta Strada are more composed, but just as noteworthy. 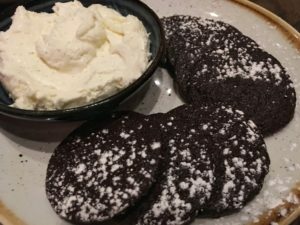 The restaurant is known for “mascaporeos” – a play on Oreo cookies with chocolate shortbreads and vanilla-mascarpone cream. Levin tweaks the dessert by upping the chocolate factor. The dessert is a hard-to-resist combo. But there’s more. Silky ricotta cheesecake with dense brownie crust and chocolate pearls is a winner, as is a fruit tart with grapefruit and Italian cherries. Blueberry gelato is also a standout. The two-week-old restaurant is still settling in, but considering it’s jam-packed the operation is running remarkably well. Adler and Levin can be seen swapping roles, with Adler jumping in to plate desserts, and Levin helping out with savory dishes on this busy night. They will each go their separate ways in their new positions, but the perfect pairing of Adler and Levin makes a mark on Alta Strada. It’s bound to do the same for Michael Schlow’s highly regarded restaurant group.